Preheat your oven to 350. That’s right, they’re going in the oven. 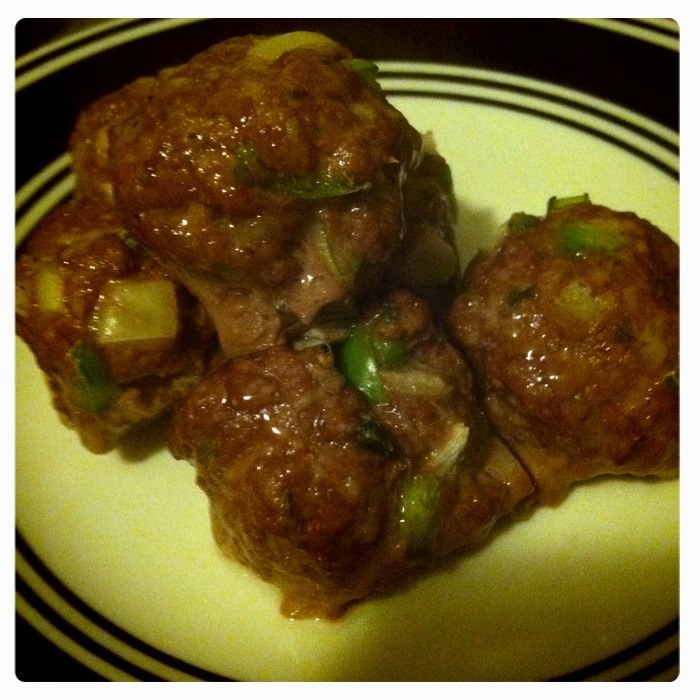 Surprising, since how I first learned to make meatballs just meant I put them in a frying pan. Okay, here we go. Grab a pound of ground beef, 1 egg, 1/2 cup bread crumbs like 4C, a quarter of an onion minced, a quarter of a green pepper minced, 1/4 tsp salt, 1/4 tsp black pepper, 1/4 tsp oregano, 1/4 tsp parsley, and 1/4 tsp garlic powder. Mash all of that up in a bowl and make one-inch round meatballs. Place on cooking sheet and bake for 25-30 minutes until cooked through. Once complete, you can eat them like that (my preference), or douse them in pasta sauce, cooked pasta, and fresh grated Parmesan. Oh yeah, and don’t forget to invite me for dinner.